© 2018 SYDA Foundation®. All rights reserved. Do not copy, post or distribute. This image is for viewing on the Siddha Yoga path website only. 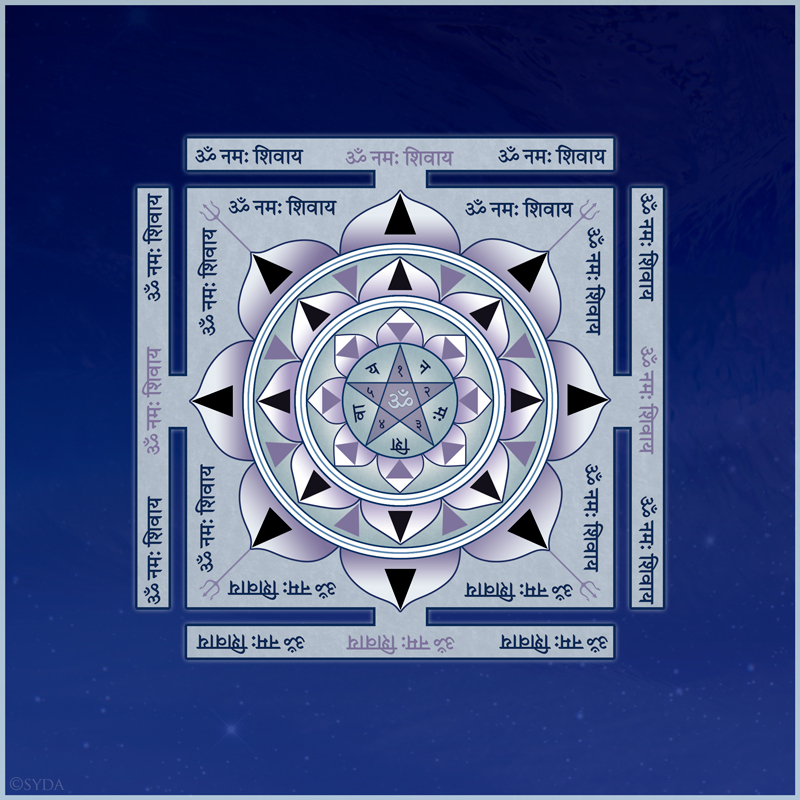 This yantra is a visible representation of the mantra Om Namah Shivaya, also referred to as Panchaskshara Mantra, the "five-syllabled mantra." Emanating from the center of the yantra, where Om is enshrined, is a star comprised of five rays—one for each syllable of Namah Shivaya. As I looked at the Shiva Panchakshari Yantra while chanting Om Namah Shivaya in the Bhairavi raga, my mind was drawn to Aum at its center. What a great tool this yantra is in applying Gurumayi's Message for 2019! I was drawn to closely examine each auspicious element of the Shiva Panchakshari Yantra. First, I noticed the beauty and intricacy of the whole yantra. Then, beginning at the center, I tenderly repeated each syllable of the five-syllable mantra, Om Namah Shivaya. Next, I concentrated on the outer rim and repeated each occurrence of the mantra as I moved my focus clockwise with great reverence and attention to the formation of the Sanskrit characters. Then I felt as if a key in a doorway turned: I sensed a vibration resonating in my heart and great love within. As I prepared to meditate, I bowed to my puja and offered thanks for this visual image of Lord Shiva’s mantra and for the abundant grace and guidance showered upon me each day. This yantra touched a musical and playful chord in me. As I gazed at it, it took me back to a dancing saptah at Shree Muktananda Ashram many years ago, where I had a vivid experience of Gurumayi’s gentleness and sweetness. I am very grateful, Gurumayi. Very beautiful! The energy from within the yantra steadies and centers me. At the same time, I sense that the yantra is alive and moving in all directions. Thank you, Gurumayi, for this visual approach to worship and to reflection on the mantra and Lord Shiva!